Summer may be winding down, but we are still here to party! This month we are headed to the Iberian Coast for a fiesta! We are bringing you wines from Spain and Portugal that will have your taste buds dancing all month long! Grab your passports because we’re headed to the Iberian Peninsula! With its immaculate coast, plethora of cultures, and mouth-watering gastronomy, it’s no surprise that we’ve decided to showcase the wines from this beautiful land. 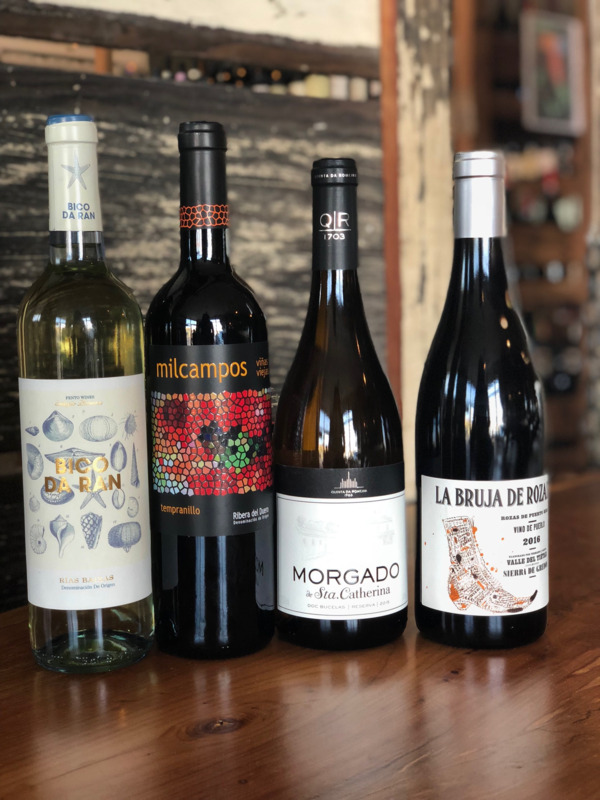 For the month of August, guests will enjoy a variety of wines indicative of their regions-Classico will savor a crisp and delightful Albarino from Spain’s Galicia region and Tempranillo from Ribera del Duero while Riserva gets to sit back, relax, and sip on an elegantly herbaceous vino Arinto from Portugal and a unique Grenache from Spain’s mountainous Sierra de Gredos. We know you’ll love the wines so much that you’ll book the next day flight to Spain and Portugal! Summer 2018 has not been letting us live! What can we drink to help us get through this blistering heat? This Albarino is here to help! A lovely bright straw yellow color with hints of green are defining factors of this crisp wine. Drinking it is as if you’re taking a bite out of a ripe juicy apple-fruity with refreshing acidity. The nose is reminiscent of citrus, fennel and passion fruit. Bodegas la Milagrosa is home to the Milcampos, which means “a thousand fields” because looking from the bodega at the vineyard along the rolling hills, each hill looks like a different vineyard, a sight to be seen! This Tempranillo is an inky ruby color with dark berry, cherry and peppery aromas. Herbs, concentrated blackberrys, cherry and vanilla fill the palate in a beautiful marriage of flavors. An excellent option for a medium to full bodied wine that gives a nice and soft finish. You may not have heard of the varietal Arinto but we are positive that you will fall in love with this Portuguese socialite. This wine displays the finest characteristics of the grape, exhibiting a rich aroma of minerals, citrus and white fruits with smooth notes of vanilla from the oak used during the aging process. The notes are well fused with other aromas, creating an explosion of flavours and complexity. An intense wine and a nice full-bodied option that goes perfectly with spicy dishes. A short distance from Madrid, the rugged weathered of the Sierra de Gredos serve as a refreshingly cool retreat from the heat and the bustle of the concept. La Bruja de Rozas is sourced from several vineyards in the vicinity La Rozas de Puerto Real. Pure Granacha from granitic sand, La Bruja is perfumed and lively with plenty of fruit with a backbone of acidity and tannins. Ranked 92 Points by Wine Advocate, Wine Enthusiast and James Suckling. August Cheese & Charcuterie Club! Dense and buttery cheese made from raw sheep’s milk. Cheese is washed with olive oil during aging on wooden boards. It exhibits aromas of lemon finishing with a light piquancy. Pair with a bright peppery red, like a Tempranillo. A time honored recipe from Spain, but handmade in the USA. All natural, gluten free, no nitrates or nitrates added. Enjoy at room temperature on its own or serve on a charcuterie board with cornichons, dijon mustard and a baguette. Les Trois Petits Cochons AKA Three Little Pigs has produced award-winning, all natural pâté and charcuterie since 1975 by crafting small, handmade batches using high-quality ingredients.